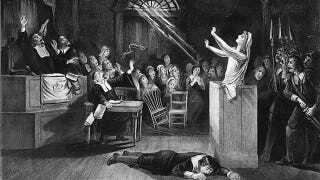 A team of dedicated researchers at the University of Manchester spent two weeks photographing a recovered notebook documenting a 1645 trial for witchcraft, so that the world may know of the evil witch who "confessed to sleeping with the devil when she was tortured." It is unknown whether or not "devil" means any man who was not her husband, and if being "tortured" refers to "that time of the month" or "living in a society that will hang a woman just because they think she's a weirdo." At any rate, you can check it out here.